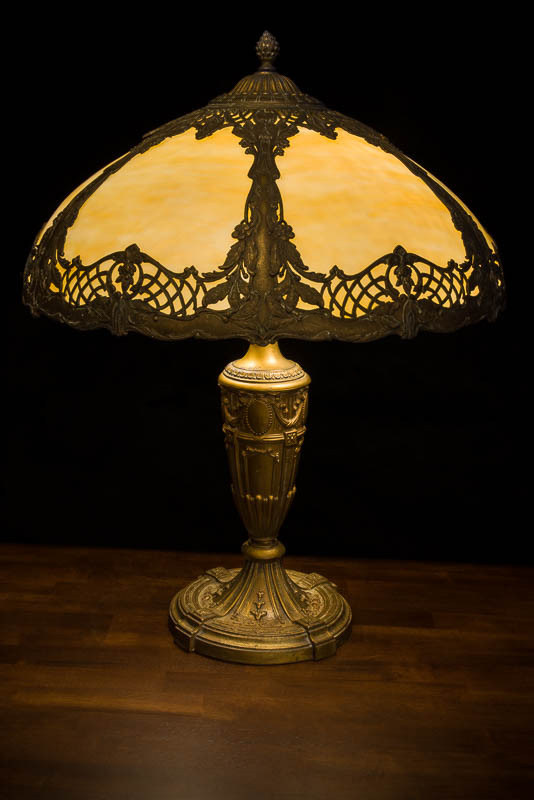 My grandfather saw this art nouveau table lamp sitting by the curb awaiting the garbage man sometime in the 1920s and what could he do but pick it up. He took it home, rewired it, resoldered a couple of the tabs that hold the curved stained glass in place. It graced his quarter-sawn oak desk for the rest of his life and now it graces my desk. It’s a fairly large lamp, standing 23 inches tall and 18 1/2 inches in diameter, and it’s lit by two 60 watt incandescent bulbs. Normally, I put artifacts either on white or black seamless so that the only thing to capture the viewer’s interest is the object, but in this case, I thought it called for something reasonably table-like. I set it on the workbench that I use as a studio and let the backdrop hang down behind. The difficulty with photographing a lamp is that it is a light source that is dimmer and a different colour than my studio flashes. So, first step is get the balance of light between the lamp’s emitted light and the flashes’ emitted light correct. Luckily, I’m not using film so I don’t have to muck around with light meters and prayer. With digital, I have instant gratification and can see immediately the effects changes to expose and lighting make. When photographing artifacts, I usually want the greatest depth of field I can get. This puts all of the details in focus so viewers can get a total impression of what the thing looks like. So, in this case, because the object is large, and my studio is small, my camera is pretty much as far back as it can go I thought I’d go with a low f-stop, somewhere between f16 and f32. It turns out f20 did the trick. The next issue is shutter speed. I try to shoot at ASA 100 because I really hate digital artifacts (the really bad kind of artifacts), which equates essentially to what we used to call grain in the days of film. It’s the irritating bits that show as not black in the black areas of the image. There are at least two techniques to eliminate or reduce this: one is shoot at a low ASA, and the other is “shooting to the right.” I’ll cover “shooting to the right” in a later blog, probably in April. So, back to shutter speed. Exposing for the flash is easy. 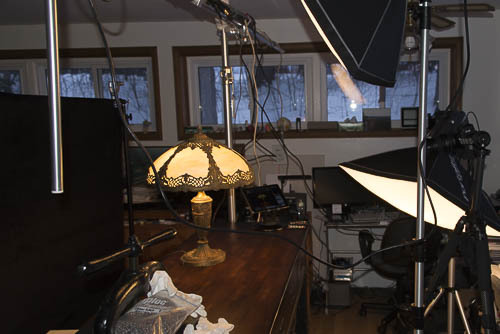 I use two Elinchrom BX500Ri flash heads equipped with soft boxes, and I dialed them back until they didn’t overexpose the outside of the lamp. If you don’t have fancy studio flashes, you can move your off-camera flashes or lights back, or bounce them to adjust the light. 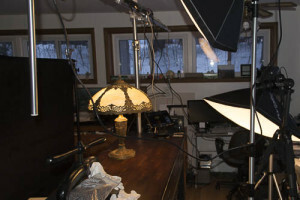 I pointed one down to the lamp from a position slightly above the lamp and right beside the camera, to give the effect that the lamp’s own light was perhaps bouncing off the room’s ceiling and walls. Otherwise, it would look, well, um,… …lit. The other flash was dialed down even more and aimed specifically at the table to eliminate any shadow of the lamp from the first flash on the table and to give the appearance that the table lamp was lighting the table. In this case, to expose for the lamp light, it worked out to a five second exposure at f20. The flashes both fired at the start of the exposure for their duration – somewhere around 1/250th of a second, and then the lamp light continued to be exposed for the rest of the exposure. Now for the bit where I cheated. Normally, I’m all about getting the colour perfect. In this case, when I white balanced on the grey card, I got an image that was nicely illuminated, and the colours looked okay for daylight. But I wasn’t looking for daylight. The effect I was going for was what the lamp looks like when it’s on at night. I knew the lamp was putting out tungsten coloured light, which is 2850 degrees Kelvin. The grey card balance when using the flash together with the tungsten came to 2800 K and gave it a slightly green cast, which isn’t right. So, I nudged it over until it looked right, which is 3191 K. But just this once! I swear! Maybe. So, on to post production. I didn’t do much to this image other than the colour balance change I just mentioned. I did a slight graduated filter to bring the flash on the forward edge of the table down by slightly over a stop, because the flash was too close to the table. You may guess where the power cable for the lamp is, and you guessed right if you thought it was masterfully positioned to drop over the edge of the table directly behind the base of the lamp.